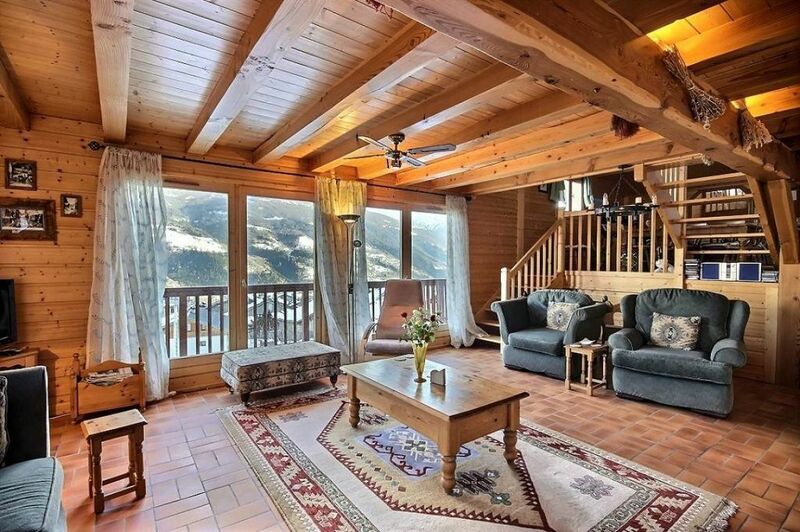 This is an exceptional chalet close to Bourg Saint Maurice. In a peaceful location just above the village. It is a 5 minute drive to the centre of Bourg Saint Maurice, the funicular to go to Les Arcs Paradiski and the station. With 4 bedrooms, a garage, a big cellar/laundry, garden and great views, this chalet would make a great all year round home in the mountains. On the ground floor, there is an entrance hallway with a toilet. You move through into a cosy lounge/dining area with fireplace and a fitted kitchen as well as a nice balcony. It would be make a perfect home in the mountains for a family. Upstairs, there is a spacious mezzanine which makes a great TV area, children’s play area or an additional sleeping area. There is further a double bedroom with its en suite shower room and dressing. Downstairs, from the living accommodation, there are 3 bedrooms, a big bathroom and a separated toilet. Lastly, the exceptional room of the chalet is the huge room for after ski relaxation : big jacuzzi, nice sauna and shower with great views through the big French doors, offering the mountains and the valley panorama. There is also a garage and a big cellar. The views from the chalet are amazing on the ski resorts of les Arcs and La Plagne Paradiski, and the terrace is facing south. Pole of attraction of the valley and world-famous thanks to its 4 high mountain sites, the town has also gained its recognition. through great sporting and cultural events level with its ambitions and those of its inhabitants. A short distance away from Italy, Bourg Saint Maurice, the capital of Haute-Tarentaise is the dream place to discover the sites of Les Arcs and the Paradiski skia area in just 7 minutes via the funicular.